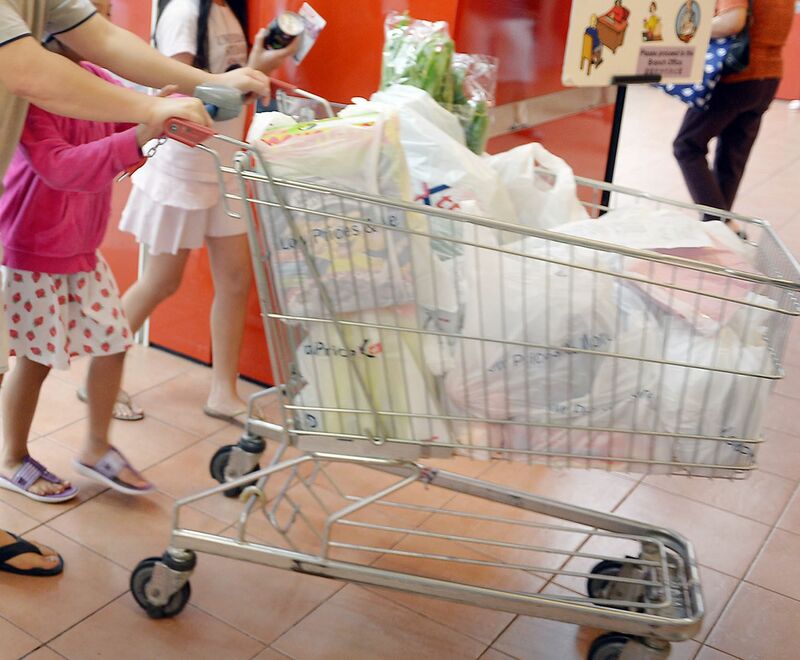 There has been much buzz since news broke that local supermarkets are in talks to charge for plastic bags in The Straits Times (Sept 24, 2; Oct 5, 6). Civic discourse on this issue is not new - the Singapore Environment Council produced a 2013 position paper with recommendations to reduce wastage and inefficient usage of plastic bags. Charging for plastic bags was one of them. While it has been informative reading the recent public opinions on this issue, we felt a few talking points could have been better elucidated on with less emotion and more impartiality. Plastic bags are given out freely with purchases at supermarkets. Consumers also see benefits through the reuse of these plastic bags in their daily life. The real costs of plastic bags are ignored, and overconsumption ensues. First, there is the cost of producing the plastic bags and operational cost of bringing them to consumers. Second, there are many negative externalities, including many environmental costs, associated with plastic bags. In the economic context, such a situation has led to a market failure for plastic bags. We agree that the right pricing will correct this market failure and reduce the consumption of plastic bags. Plastic bags usage in England dropped more than 85 per cent a year after a 10 Singapore cents surcharge per plastic bag was introduced. This shows that plastic bag consumption can be price-sensitive - a small increase in prices can lead to a huge drop in demand. A tax on plastic bags would be the most direct and effective way of correcting this market failure. Whether such a tax is palatable to consumers remains to be seen. In lieu of a tax, the Government seems to be taking a consultative approach to the issue, even letting the supermarket chains work out the implementation of a surcharge. While an industry-determined plastic bag surcharge can be viewed as good corporate responsibility, one wonders if private firms like the supermarket chains will know enough to weigh the societal costs and benefits associated with plastic bags. If left to their own accord, firms and consumers may not capture the full externalities of plastic bags. Last year, the National Environment Agency (NEA) called for a tender to study how different types of single-use carriers compare in terms of cost and impact on the environment. The results should play a part in decisions on the pricing of plastic bags. There is also a potential for exploitation by the supermarket chains. Are the production and operational cost of plastic bags already factored into supermarket products? If so, will shoppers see a general reduction in grocery prices when this cost is transferred to the plastic bag surcharge? Will the supermarkets aim to make a profit by treating the grocery bags like any other product on their shelves? How will the profits be treated? Transparency will go a long way in providing assurance to consumers who might, in turn, be persuaded to support the surcharge. We would take a step further and argue for a national cost-benefit analysis on plastic bags. Considering all the costs and benefits associated with plastic bags will address the issue of asymmetric information, an economic concept of unequal information between stakeholders. Government or civic contributions, through the NEA, environmental non-governmental organisations, and even the Consumers Association of Singapore, are required to ensure that the necessary information is accounted for. This will allow for a transparent, fair and consultative approach in determining the price of plastic bags. Earlier, we pointed out the price sensitivity of British consumers to plastic bags. Will local shoppers react similarly to a price surcharge? Miniso in Singapore has successfully implemented a plastic bag surcharge (The Straits Times, Sept 24) and Ikea has even stopped issuing plastic bags. However, successes at these retailers might not translate directly to equal successes at curbing the overall ubiquity of plastic bags. Shoppers make fewer regular visits to these retailers compared with supermarkets. Purchases at these retailers are different for groceries as well. Consumption patterns for plastic bags at supermarkets differ. We also suspect that shoppers might have compensated by collecting more plastic bags from supermarkets. One encouraging success story is an incentive scheme offered by FairPrice. The supermarket chain has offered a 10 cent discount on a $10 minimum spend if shoppers bring their own bags. We have also, at times, avoided the use of plastic bags at the FairPrice self-checkout counters due to the prompt asking us whether we have brought our own bags. The mechanics of prompting this incentive at the self-checkout counters at FairPrice present a very interesting opportunity for a field experiment. Supermarket chains can vary between a discount or a surcharge and their amount, and enable or disable prompts to see which combination works the best for discouraging the use of plastic bags. Traditionally in economics, either a carrot or stick approach is prescribed to correct a market failure. Behavioural economics seem to suggest that a surcharge will be more effective since people tend to overweigh losses over gains - people are loss averse. Saliency provided by prompts during the checkout process should also prove effective in getting shoppers to avoid using plastic bags. Supermarket chains are masters in eliciting and utilising consumer behavioural insights. This can be put to good use on the issue of plastic bags. An online design community platform, OpenIDEO, recently issued a challenge on "How might we get products to people without generating plastic waste?" A Singapore-based design team won an Ideator's Award after their idea was one of the top 16 shortlisted. They came up with their solution through a process of empathising with consumers, defining the problem, and iteratively ideating, prototyping and testing solutions. Finding an effective and innovative solution to the issue of plastic bag wastage and inefficiency will require a similar process, with inputs from civil society, private firms and government bodies, plus the right dose of behavioural insights and sound economic thinking. •Euston Quah is a professor of environmental economics and cost-benefit analysis, and head of economics at Nanyang Technological University. He is also president of the Economic Society of Singapore. Zach Lee is a research associate at NTU and Tumcreate, a National Research Foundation-funded project exploring future public transport systems.